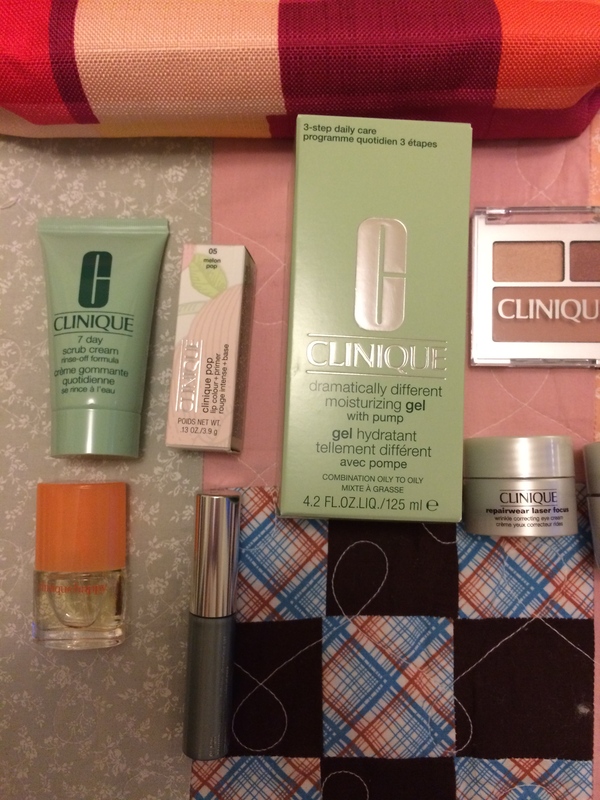 I just couldn’t resist this appealing online bonus from Clinique that popped up last month. I received the above products after ordering something of $27 or more and I thought I would do some mini reviews of these sample products. 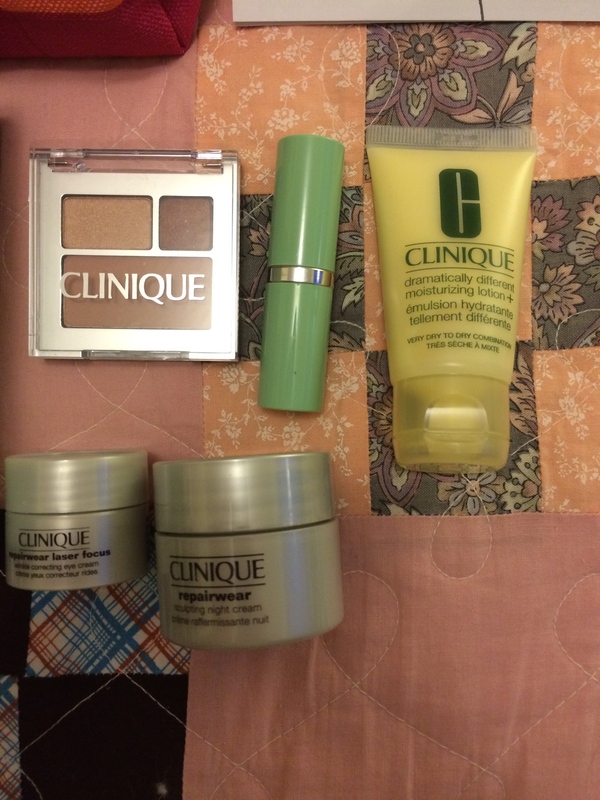 I also purchased the Dramatically Different Moisturizing Gel and a Clinique Pop lipstick and I will review these as well. I chose the “glow” option at checkout in hopes of finding some nice summer makeup options. So far I am pretty pleased with the whole bonus. Read on to see what I have to say about each product! I’ll start off reviewing the makeup that came in the bag because it is easiest to judge with one application. The first piece of makeup included was a Clinique Color Compact composed of an All About Shadow Duo in 02 Black Honey and 01 Sunset Glow and a Powder Blusher in 20 Mocha Pink. There was also your basic Lash Doubling Mascara and a Long Last Lipstick in the color All Heart. I also purchased a Clinique Pop lip color in Melon Pop. I wore the eyeshadow duo and All Heart on the same day and I have to say I’m impressed. They both definitely go along with the “glow” moniker and look very natural and summery. I’ve had trouble before with the pigment of lighter base colors from Clinique (I’m looking at you Rock Violet) so I was pleased that Sunset Glow was noticeable. Black Honey is a bronzy shade and is something I will be reaching toward all summer because it has a lovely look in the sun. I also really liked the lipstick because it is a color I have never really seen before. It is like a mixture of pink and red, so it looks distinctive but not overwhelming. I have pictures below. I didn’t actually wear the Mocha Pink blush in these pictures but I have received that color before in another sample and I’m a big fan. It is such a beautiful neutral pink that looks good all year. You can make it look very natural or go for a more daring look if you layer it on. It almost becomes a pinkish/red when you wear it heavily which is pretty unique. The mascara is also nice, but nothing special. It creates volume nicely for me, but it definitely got better as it dried out more. The last piece of makeup I tried out was the Clinique Pop Lip Color + Primer. I have been hearing great things about this lipstick all over the internet and I couldn’t resist. I must admit I am extremely impressed. The lipstick is definitely the most moisturizing lip color I have ever worn. It doesn’t dry down on your lips and I was still comfortable after 4 hours of wear. There is no drying or flaking lips with this stuff; it is incredible. I bought the color Melon Pop, which is a peachy neutral color and the pigment payoff is ridiculous. I highly recommend trying this product out if you have a chance. 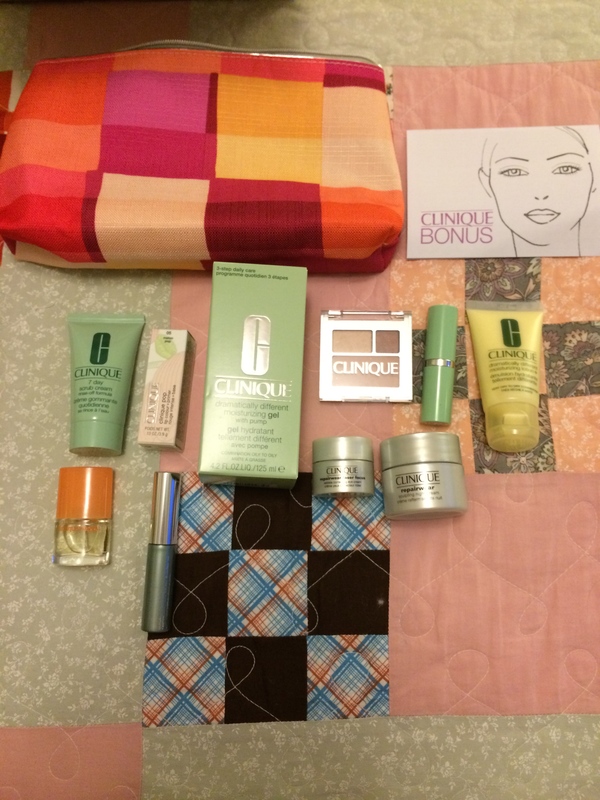 This entry was posted in Review and tagged clinique, clinique online bonus, clinique online bonus 2015, clinique online bonus in glow, clinique pop. Bookmark the permalink. I love that first lipstick color!! I know right! You can totes borrow it sometime. Shiver me timbers, them’s some great inaromftion.